We use our own YourEssentialSelf Aromatherapy Products with each of our facials, which are Cruelty Free NOT tested on Animals. Hot Stones - A Natural Face Lifting Treatment - Herbal Compresses or an Indian Ocean Float as part of Your Experience. 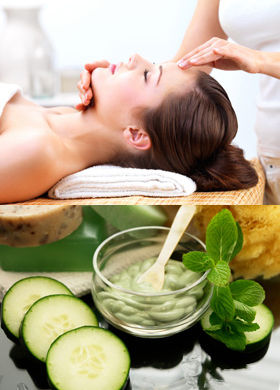 Hot muslin & towels are used to enhance the effects of the natural products. Argan oil protects the skin against wrinkles appeared due to premature aging. It also helps reduce the appearance of crow’s feet (wrinkles under the eyes). It is a very good remedy for dry skin. It does freshen and soften the skill more readily than any other skin softness creams or oils do. Protein rich Argan oil is very good for the elasticity of skin. It strengthens the protein bonding structures in the skin which works to tighten the skin and make it look fresh. Argan oil is good for reducing skin irritation. It quickly heals the marks caused by scratching on skin. One of the most amazing facts about Argan oil is that along with dry skin it is equally good for oily skin. Sebum is an oily substance secreted by sebaceous glands which keeps the skin wet and protects against dryness, but its excess secretion is bad for the skin. Argan oil regulates the secretion of sebum and keeps it to a manageable level. Argan oil helps to prevent stretch marks on skin made by pregnancy. It gives strength to the weak and easily breakable nails. It also strengthens the delicate skin at the root of nails and makes it smooth. Argan oil is useful in the treatment of skin inflammatory diseases like Acne, Chickenpox and Psoriasis. Red dots or patches appear on the skin in these diseases. In Arthritic and Rheumatic conditions in which joints and tissues of the body are damaged, Argan oil greatly soothes and reduces the pain.